I wanted to make a sweet southern-inspired "chicken" salad sandwich. I opted shredded over chopped dice for a more delicate side dish. This is not the savory type that most are used to (which I also really like). This is for a tea party or something equally silly. White gloves and all that. I used Morningstar Farms strips, but who knows, in a year or less, these might not be vegan, either. They recently unnecessarily messed up changed their Crumbles recipe to add milk and eggs. BOO. Tell them that's no good , if you are so inclined. Note- This is a SWEET salad. If you want less sweetness, cut back the grapes or cranberries. I think the balance is nice, but you may want to add more mayo or heat. Gently saute chik'n strips in good quality margarine on low-med heat. I added a little sherry. You want heating all the way through but not too much browning. You don't want crispy. When heated through, remove from heat and cool completely. Shred (pull apart) by hand- go with the grain, lengthwise. It creates a delicate texture. Heat the pan again (wiping out any oil) and roast pecans. Set aside, cool, and chop. Whisk mayo, soymilk, and vinegar while chik'n is cooking. Add all remaining ingredients except chicken, grapes, and pecans and mix well. Fold in chik'n, grapes and pecans. Let chill for at least an hour to let flavor develop. Toast 4 pieces for bread and add margarine to one side of each piece of bread. 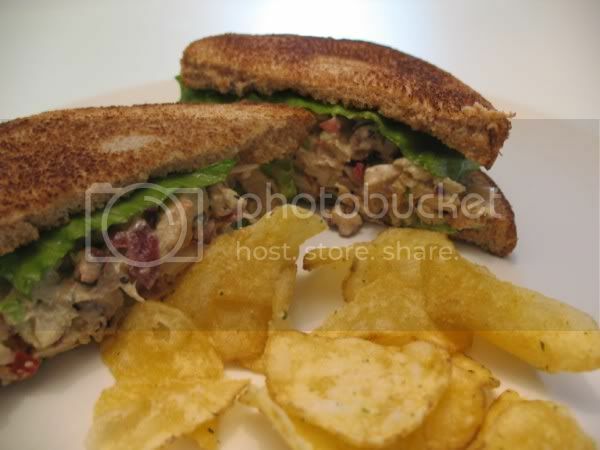 Add chik'n salad (you want margarine on the inside of the sandwich). You can line the sandwich with a nice lettuce and tomato. I like chips (the ones here are yummy Kettle Jalapeno chips) or salad on the side. this looks really delicious and i'm looking forward to trying it out. though i will complain to morningstar about the change of the crumbles, they did recently come out with new italian sausage style crumbles which are delicious and vegan. Ooooh that sandwich looks and sounds yummy, I'll have to give it a go with out British Fry's chicken strips. This looks perfect. And chock full of tasty ingredients. Just add more cheese on this one and I can remember one of my favorite dish, more greens and this is totally my thing! Thanks a lot for sharing. Definitely looks delicious. :) I'm starving now after browsing through some photos.